I am interested in art which is placed into - or is a part of - a context, and which can be experienced on many levels, not just through the intellect and thoughts. This is why working in the public space has interested me so much. Producing a story - my own selected parts set in relation to the site specific - has been the driving force of large parts of my production. Social participation is a very important part of my concept structure, both through direct involvement, where collected photos and symbols are modelled in porcelain (according to the given theme) are incorporated in the fabric of the sculpture. But also the physical aspect of being able to experience the sculpture by sitting on them, turn and drive them, slide through them or enter into them. Another aspect is music and sound. In several of my projects, both the temporary and the permanent, I have had a good collaboration with the contemporary composer, Geir Johnson. Most of my work is directly modeled in reinforced concrete. Strengthening is, in many cases, recycled materials, for example dust bins inside the rolling angels, and the old caravan to the project "Campingwomen" which were made for the European Capital of Culture Stavanger 2008. The rationality and flexibility of concrete always makes me come back to this material, which also allows a short transition between thought and action. I have 25 years of experience with iron and concrete constructions and always collaborate with engineering and concrete consultants for larger tasks. Other materials I use are stone, bronze, aluminium and various plastic materials." 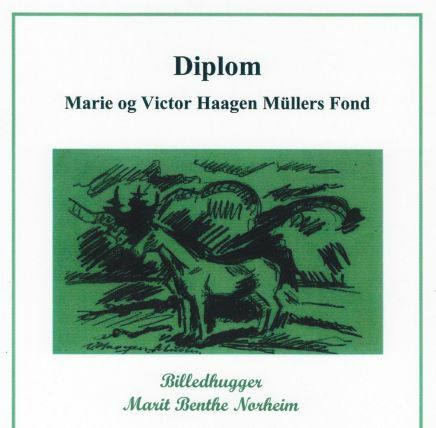 Marit Benthe Norheim, b. 1960 i Norway, living in Denmark, since 1996. Marit Benthe Norheim was born 1960 in Norway, and now lives in Denmark. She studied at the Norwegian State Art Academy, Bergen, Norway, a Travelling Art cademy, throughout Europe including 5 months in Italy, and The Royal Academy of Art (MA), London. This led to her living and working in London from 1984 until 1995. Benthe has given many group and solo shows, and has undertaken several large public commissions in Norway, Denmark, England Sweden, Iceland and Greenland. Her work is held in the Public Collections of a.o. the Norwegian Contemporary Art Museum and the National Gallery of Art, Norway and the New Carlsberg Foundation, Denmark. 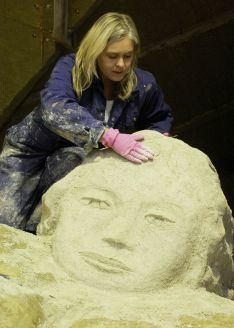 Some of her large public sculptures include local community involvement, and two of them use themes from the female figures of Henrik Ibsen’s writings. The first one is “Woman of the sea” at the harbor of Sæby, Denmark. The last one is the “Rat Virgin” from “Little Eyolf” a 7m. tall sculpture covered in a mosaic of porcelain eyes, made by 2300 children in Skien, for the Ibsen Anniversary 2006. She has collaborated with the European Capital Stavanger2008 and her current project Life-boats is part of the European Capital Aarhus2017. She has been preoccupied with the way popular, familiar symbols open up access to the irrational, and has herefore used a.o. angels or galleon figures. When combining these with a less accessible form of artistic expression, the contrasts often produce a fruitful result. The award is given as recognition of artistical achievement. The prize is granted once a year. The prize is awarded to an artist, a group of artists or to the authors behind cultural initiatives in Hjørring Municipality. To be eligible for consideration for the award, the candidate must meet one or more of the criteria of quality, profiling of Hjørring Municipality, new talent, unassuming manner or fine art. "It struck me immediately that here was a girl with exceptional abilities, raw natural power, artistic courage and strength in the exploitation of her favorite material concrete."